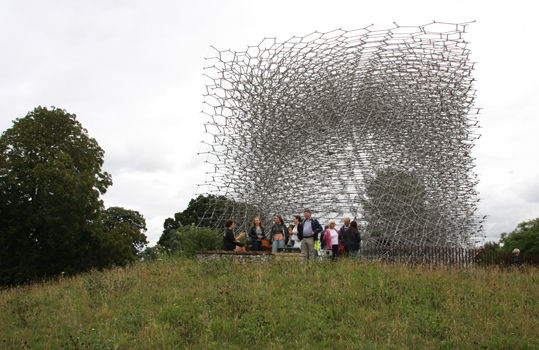 Yesterday I posted a photo of one of the oldest man-made structures at Kew Gardens - the Temple of Aeolus - and this morning I am sharing a picture of the most recent - the Hive. Both buildings were inspired by aspects of nature and both are open to the air. The temple was dedicated to the winds and built on an artificial mound so people could appreciate fresh breezes from all directions while enjoying the view of the gardens. The Hive was inspired by the abode of bees. It tries to give humans an experience of life through the senses of the bee. It is constructed from around 170,000 parts including thousands of pieces of aluminium which catch the changing sunlight. There are 1,000 LED lights dotted around its core which glow and fade, while a unique soundtrack hums in response to the activity of real bees in a beehive behind the scenes at Kew. The Hive has to be experienced to be fully appreciated - a flat picture doesn't portray what it is like to be inside it, hear the gentle hum of life all around and watch the lights gently change. It is relaxing, but also makes you feel part of the great community of life. As well as being an art installation and educational project, the hive collects valuable scientific data and is surrounded by wildflower meadows to attract bees. Kew staff are available to answer questions and there are free talks about bees too.